Better Plants for Birds at the City's Bog Garden! At the invitation of Greensboro Beautiful, Inc., members of TGPAS and the Triad chapter of NC Native Plant Society (NCNPS) have been providing guidance and hands-on assistance for removing exotic invasive plants and planting new native plants at the Bog Garden. Following our initial walk-through at the Bog Garden in September, a small group of volunteers has met at the Bog Garden every Tuesday afternoon to mark invasive shrubs for removal by staff at the Bog Garden and to pull up and dig out smaller invasives. Mark Rose, a horticulturist and leader in NCNPS who was formerly a member of the Bog Garden Management Committee, met us at the Bog Garden on Oct. 31 to assist with identifying some of the unusual plants there. On Dec. 12, Sharon Day of Mellow Marsh Farms, one of our Bird-Friendly native plant nursery partners who is experienced in stream restoration, consulted with us about which native plants to add along the creek bank and in other areas. We — the Bog Garden Plant Committee — are developing guidelines for the selection of native plants, focusing on the Piedmont Alluvial Forest natural plant community that is most typical for the Bog Garden. We’ve also been busy with planting in two areas that have been cleared of invasive shrubs. 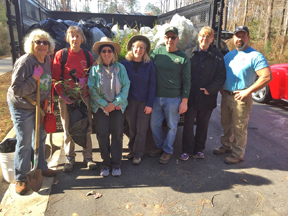 On Dec. 4, our group of five went to Apex, NC, along with two Bog Garden staff and a city truck to rescue Christmas Ferns at a site that is scheduled for developed. Thanks to Tom Harville of NCNPS for alerting us to this opportunity and making arrangements for us to visit the site. As of Dec. 19, we have planted 241 rescued ferns in the Bog Garden. In addition we have planted three Eastern Redcedars, Foamflower, and Alumroot propagated by NC A&T horticulture students, a flat of Foamflower donated by Guilford Garden Center, and a few other native plants rescued from the Apex site. Because winter is the best time to remove and treat invasive plants, we will continue working at the Bog Garden every Tuesday from 1:30-4 p.m. — if the temperature is at least 40 degrees. We’d love to have some helping hands, as we work to enhance the Bog Garden and make it a better place for birds and other wildlife. You can email Diane Laslie, diane.laslie@gmail.com, or Ann Walter-Fromson, annwf7@gmail.com for details if you plan to join us. It takes a community to restore our natural areas! Photo (above): The Bog Garden Plant Committee and city garden staff with a truck full of rescued ferns in Apex. From left to right: Lynda Waldrep, Diane Laslie, Judy West, Ann Walter-Fromson, George Satalino, Deborah Staves, and Steve Green. Photo by Tom Harville. Carpool: Meet at 1:45 p.m. at Whole Foods Market in Friendly Shopping Center, 3202 W. Friendly Ave., Greensboro, under the sign nearest to Friendly Avenue. (Not in front of Sears.) Meet by 1:45 p.m. so that we can leave promptly at 2 p.m.
Join us for our Second Sunday Nature Walk on Jan. 14 when we explore the Iron Ore Belt Access to the Haw River State Park. Located just north of Greensboro, picturesque terrain makes Haw River State Park the perfect place to connect with nature. The Iron Ore Belt Access holds evidence of a long history of human interaction with the land, from prehistoric occupations to Revolutionary War activity to agriculture. We have previously explored the Great Blue Heron Loop trail at the park, so this will be an exciting new place to discover. We will join Andrew Boos, head ranger at the Iron Ore Belt Access. He has been a State Ranger with NC State Parks for more than five years. He previously worked at Falls Lake State Recreation area and the Rolling View Area located in east Durham. There is signage for the Iron Ore Belt Access along the roadside of Church Street. Those who drive themselves should look for a large brown sign at the intersection of the park entrance and Church Street. The sign will read "Iron Ore Belt Access Haw River State Park." Because of limited parking at the access area, we strongly encourage participants to carpool. Our carpool meeting place is at the Whole Foods Market in Friendly Shopping Center, 3202 W. Friendly Ave., Greensboro, under the sign nearest to Friendly Avenue. (Not in front of Sears.) Meet by 1:45 p.m. so that we can leave promptly at 2 p.m.
Are you confused about birds when you see them in the field? Do you need a way to keep up with sightings you’ve made through the years? Not to worry; there’s an app for that! An abundance of on-line and downloadable apps is available to identify birds by sight or sound and to record sightings. Our speaker, Roberta Newton, will sort through and review resources including Cornell’s "Merlin" and "eBird," Princeton’s "Warbler Guide," “ID Bird Songs”, and other well-known on-line guides. Roberta Newton is one of our own, a member of T. Gilbert Pearson Audubon Society and the Piedmont Bird Club. Since retiring from Temple University Department of Physical Therapy, she has enjoyed birding and assisting with Citizen Science projects. Our annual Saturday morning field trip with the Piedmont Bird Club to the White Street Landfill in Greensboro will be on Saturday, Jan. 6. This is always a great trip, and we have a good chance of finding unusual sparrows, gulls, hawks, ducks, and other interesting birds. The trip leader makes special arrangements for the birding group to enter this facility. The places we go in the landfill are on paved and dirt roads among grass-covered landfill areas, ponds, creeks, and mature mixed forest. It will be mostly driving slowly with frequent stops and some short walks where necessary. It isn’t necessary to bring anything, but binoculars and a field guide will come in handy. Dress warmly for an open windy environment. If it’s a cold day, you might appreciate a warm beverage, as well. Where to Meet: Be sure to note that our gathering place will be different from where TGPAS normally meets before field trips. We will meet at 8:30 a.m. in the parking lot of the Congregational Church of Christ, 400 W. Radiance Drive, Greensboro, to carpool. It is important to carpool with as few cars as possible so that our group will not interfere with trucks that usually are at the landfill. Cancellation: The trip will be canceled if we expect inclement weather. There is a chance that the City will close this site to us under special circumstances. If that happens, an alternate site focused on winter birds will be chosen. Consequently, checking with the leader ahead of time will be to your advantage. Please contact the leader to let her know you plan to participate. Leader: Carolyn Allen, 336-288-3045, texallennc@aol.com. Join us on Saturday, Jan. 27, for a fun winter trip to Pee Dee National Wildlife Refuge to look for waterfowl and other birds. This is a joint field trip with Piedmont Bird Club. 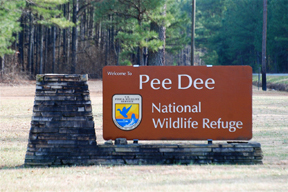 Located only about an hour and a half drive south of us, Pee Dee NWR is the unit in the national refuge system closest to the Triad. The refuge comprises more than 8,000 acres along the Pee Dee River in Anson and Richmond counties. It was established as a waterfowl sanctuary, and in winter it can host up to 16 species of waterfowl. Pee Dee also has extensive uplands of hardwood forests and meadows that attract many land birds. For detailed information and many beautiful photographs of birds on the refuge, go to the following website: https://www.fws.gov/refuge/pee_dee/. Normally the waterfowl impoundments are closed to the public from Nov. 25 through March 14, but we have been given special permission for this field trip to be at the edge of the impoundments for a short time to observe the waterfowl. No stores or restaurants are nearby. Be sure to bring a picnic lunch and plenty to drink. Binoculars and field guides will be useful. Scopes will be handy to see distant waterfowl. Meet at 7:15 a.m. for carpooling at the Whole Foods Market in Friendly Shopping Center, 3202 W Friendly Ave, Greensboro, under the sign nearest to Friendly Avenue. (Not in front of Sears.) We expect to depart at 7:30 a.m. and be back by around 6:00 p.m. Participants who drive separately may leave when they wish, of course. If going directly to the refuge, meet just inside the entrance near the restrooms at about 9:15 a.m. The refuge main entrance is located at 5770 U.S. Hwy 52 North, Wadesboro, NC 28170. Cancellation: Check the weather forecast for Wadesboro before leaving the Triad. The trip will be canceled if the forecast is for rain all day or hazardous conditions such as an ice storm. It will not be canceled for damp or cold weather. The contact person for this field trip is Dennis Burnette, 336-299-4342, (cell phone 336-337-8692 during the trip only), deburnette@triad.rr.com.